A Facebook user’s Terry Coffey’s post about Caitlyn Jenner went viral, and he shared an interesting (coincidental, ironic) update about it afterwards. This seems too ironic to be true. I’m a little confused. Having a hard time believing what I’m seeing. Is there some kind of Facebook bug? It shows that the post I put up yesterday about courage and bravery, has been shared 339,000 times? I have over 1200 friend requests in my box? Is someone else experiencing this? This has to be a glitch. Oh, please, please PLEASE tell me somebody did this on purpose! 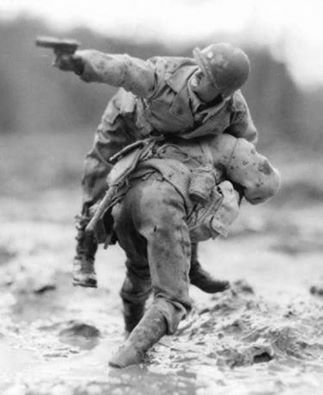 Here’s the thing: that is not a photo from WWII or any other war, it is a picture of a pair of posed Ken dolls that are part of an extensive diorama crated by a NY man named Mark Hogancamp. Hogancamp has constructed a fictitious, miniature Belgian village in his front yard as a therapeutic measure to deal with the PTSD and brain damage he experienced fifteen years ago after a savage beating by five men. The reason he was beaten? He wore women’s clothes. He has recreated WWII-esque battle scenes like the one pictured as a cathartic comparison to his own experience. That experience: being beaten nearly to death for transvestism. Don’t know about the relative worth of this, but feel free to see if there’a a bottom to get to on this! Some viewers have maintained that Coffey’s choice of photograph was deliberate, and that they were unable to locate the same image through web searches of their own. However, other copies of the same photograph (such as one described in a caption as depicting ‘Great shot of WWII action, the bravery of American soldiers and the love of their fellow soldiers’) could be found online prior to his use of it in a Facebook post. For now, it appears Coffey selected a photograph at random based on a keyword search, and after social media users tipped him to the coincidental nature of his choice of image, he reflected upon his new-found social media fame and responded accordingly (and gracefully).